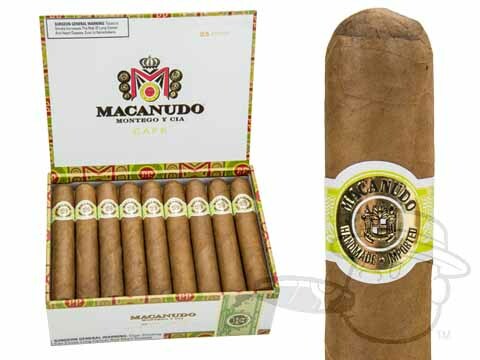 Macanudo Gigante Cafe delivers smooth, mellow, and classic flavor in a big-ring 6x60 vitola. Excellent mild taste for anyone looking for a long deep smoke that leaves you satisfied with a light aftertaste. Great for cigar smoking starters that need a full taste. Very mild, easy draw, long ashes. What more could you ask for? Macanudo are always a great choice, but this one is tops. Has a great draw, sooth taste and lasts. Waiting for them to get back in stock! Macanudo Gigante Cafe is rated 4.9 out of 5 based on 6 customer ratings.